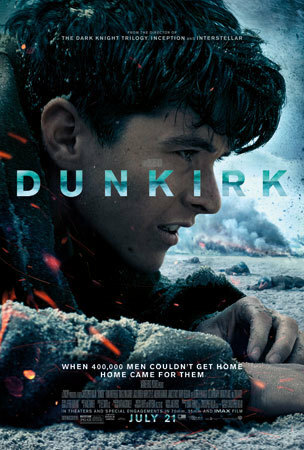 In real life, the World War 2 story of Dunkirk is pretty amazing. When German tank divisions invaded France, they pushed back allied forces with a vengeance. It was time to retreat but the allies (Britain, France and Belgium) got pushed up against the French coast with no escape route except by sea so every good guy ship available both military and civilian was called in to help rescue as many soldiers as possible. It was brutal. Alex (Harry, left) waiting on the beach for rescue Courtesy of Warner Bros.
Popular musician Harry Styles, formerly of One Direction, was such a fan of movie director Christopher Nolan (the Dark Knight Batman movies) that he was hot to try out for the film. Nolan admits that he wasn’t aware of how famous Harry was. 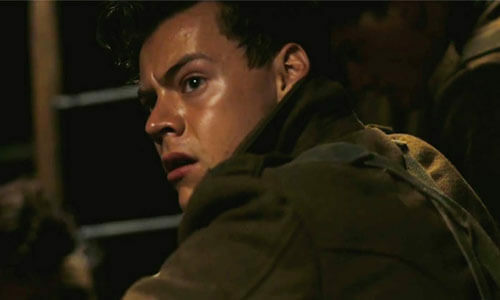 He’d only heard of him from his daughter but Harry “fit the part wonderfully and he earned his seat at the table” so the singer was cast to play young soldier Alex. Harry’s hair is short in the film and he’s said that he knew he’d have to cut his long-ish locks to fit the hairstyles of the WW II era and it was no biggie. As for future acting, Harry hasn’t really thought too much about it. He has a world tour coming up starting in September, so it’s back to his music. As for Dunkirk. 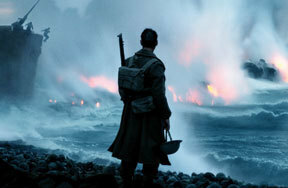 Harry says you don’t have to be a war movie buff to like it. “It’s scary, emotional and keeps you on the edge of your seat”. Q: There isn’t a lot of dialogue in this movie. What does a Christopher Nolan script even look like? Harry: It’s technical. I think the thing with Chris’s script is the same across a lot of his other movies which lend themselves to multiple viewings. I feel like you learn new things each time you watch it. I felt like it’s very much the same (with the script). I felt when reading the script, you learned new things and found new things you were excited about within it. I think once you get your head around it, because it’s obviously so technical, you kind of enjoy it more and more the more times you read it which is amazing. 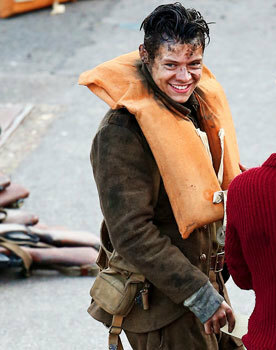 Harry on set in a lighter moment Courtesy of Warner Bros.
Q: You are in a supporting role in this film. (Music) people like Eminem and Elvis made their film debuts in a starring role. Why did you feel that this role was the way to go? Harry: I think, for me, when I first heard about Chris making this film, I was kind of already excited to watch it. I think it’s something I would have been excited for had I had absolutely no involvement. I can’t say I really thought too much other than that about it. Being on Chris’s set, he’s so passionate about it and it’s so infectious and he creates this environment where everyone, cast and crew has one focus and it’s doing the best for him and the best for the film and making it as good as it can possibly be. I don’t think there’s any room to think about anything more personal than that. I feel like everyone had the same goal, just to do their part for the film really. NOTE: Chris says he sees the potential for his cast to do things they’ve never done before. “You can’t worry about previous roles or Harry’s celebrity. If we do our job right, audiences will become invested and take it on its own terms”. Q: How hard was the film physically? Harry: It was terrible for me physically. 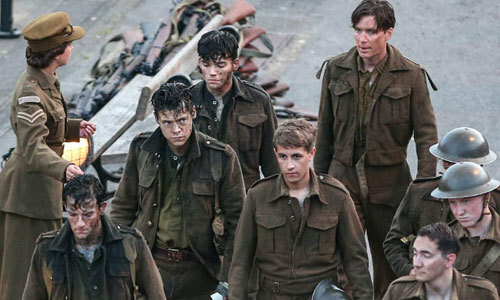 I think the thing was that everyone on set was incredibly aware of however tough it got for us, it was nothing compared to what was happening (at the real Dunkirk evacuation). I think with the focus we all had of trying to do our jobs to be a part of telling the story, there wasn’t any room for personal comfort or complaining. It’s also impossible to complain on a set where your director is going through the exact same thing as you. He’s not in a tent. He’s in the water with you. He’s in the sand with you. He’s cold. He’s the first one there and the last one to leave. If anyone thought about complaining, they were kind of like ‘Yeah, I might not do that actually, because (Chris is going through it too)’. Harry as Alex in a tense moment Courtesy of Warner Bros.
Q: What was the best note on acting that Nolan gave you as a newbie actor? Harry: I think Chris kind of creates this world around you where you don’t have to act too much. A lot of it is reacting. I think as much as anyone could possibly help you be in a situation, he creates that for you. Don’t think about acting too much, I think is the best thing. Chris puts you at ease in terms of just ‘say what you need to say and don’t try to overthink it’. Chris just creates an environment on set where you’re not intimidated so much by the scale of everything that’s going on behind you. He makes it feel very intimate with you and the camera. That helps to not distract you and, he’s nice. 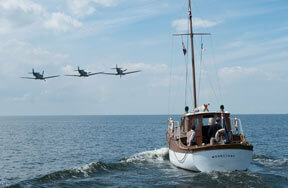 Q: As a Brit especially, were you aware of the Dunkirk operation or did you do research on it? Harry: I think it’s obviously something that you learn at school but it’s told in this very washed over way. You are often taught about the end of the war and there’s so many events after it, I think it’s often looked over in terms of just how pivotal it was compared to the events that came afterwards. So, I think we all feel kind of lucky to be a part of something that gets to tell such an important story in a little more detail than I think it’s usually told in. 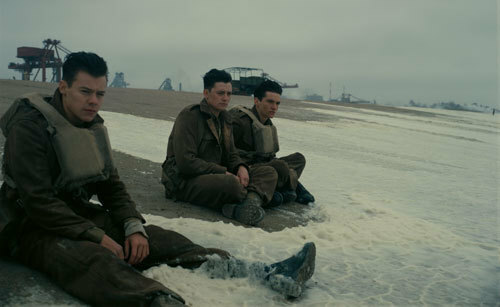 Harry as Alex (left) with other worn out soldiers Courtesy of Warner Bros.
Q: What did you learn from this first film role? Harry: I think being on a set like this it’s hard not to be always learning. Being around people that you’re a fan of just feels like privilege. I think you try and soak up as much of that as possible. Chris is not really controlling you and I think he gives you the confidence to be as natural as you can. You never feel like you are trying to hit too many notes at the same time. He never has you overthinking stuff. I just felt very lucky to be on the set of a man I’m personally a fan of his work and with a great group of actors. So, I just felt very grateful to be involved really. Dunkirk Poster Courtesy of Warner Bros.
See Dunkirk in theaters this Friday, July 21st! 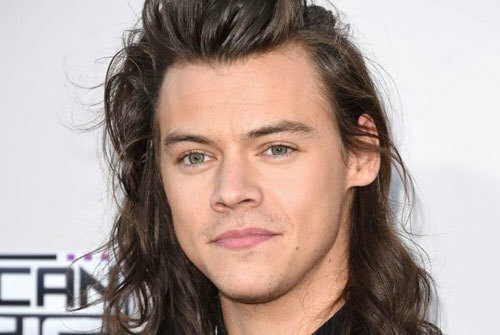 Are you happy to see Harry Styles branch out into acting or do you wish he’d just stick to his music or…..don’t care? Lay down a comment below! 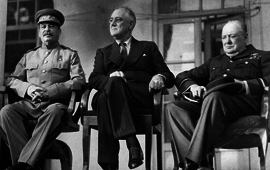 What Were the Allies Also Known As?